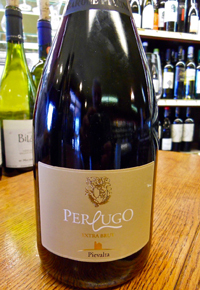 N.V. Barone Pizzini, Pievalta “Perlugo” Extra Brut VSQ, Sparkling, Castelli di Jesi (Verdicchio) Le Marche, Italy. This sparkler is utterly spellbinding and rivals any top Champagne, I can not begin to tell you how good this fine bubbly really is! I had never had sparkling Verdicchio before, and wow, this is fantastic with wonderful depth, richness, life and complexities on offer, and I can tell you I’ll be drinking as much of this as I can get. Barone Pizzini has a main property in the “Champagne” region of Italy Franciacorta, but it is this amazing Le Marche estate and it’s Extra Brut Sparkling Verdicchio that has blown my mind. The Perlugo is made from biodynamic vineyards at the Pievalta estate, in heart of the Castelli di Jesi zone and is handcrafted to perfection. The chalky soils and small yields adds to the dramatic intensity and vibrancy in this elegant bubbly, and Verdicchio comes to life loaded with nutty aromas, citrus, green apples and mineral tones all of which plays well in a fine sparkling wine where these along with pretty yeast, brioche and fig notes come in too, making for a glorious wine. This has to be one of the best kept secrets of the sparkling wine world!